TACLOBAN CITY – The Philippine National Police described the Eastern Visayas region as relatively peaceful while the army’s 8th Infantry Division theorizes there is a significant presence of high ranking leaders of the New People’s Army (NPA) communing in the region’s hinterlands. These were among the highlight reports presented by the PNP-8 and the army’s 8th ID during the Regional Peace and Order Council (RPOC) Meeting held in Catarman, Northern Samar chaired by RPOC Chairman Leyte Governor Carlos Jericho Petilla. The PNP-8 which provided a briefing on the criminality situation in Eastern Visayas describes the region to be relatively peaceful based on the crime rates recorded from November 2010 to February 2011. Police Supt. Cleve Taboso, acting chief of the Regional Operations Division of the PNP Recom-8, stressed in his report that threats by crime groups are readily addressed by concerned police thus the said general assessment. The total crime volume for the region was reported to number to 1,969 incidents, which number is 369 incidents higher than those monitored to have occurred from August to October of 2010. The PNP further reported that Tacloban City posted the highest crime volume while Biliran had lowest crime incidence for the same indicated period. In crimes against persons, Leyte province posted the highest number in crime against persons while the cities of Tacloban and Ormoc posted the highest number in crimes against property. The PNP-8, whose regional director Police Chief Supt. Arnold Revilla was also in attendance during the meeting, said the police in the region remains on top of the situation and able to control and provide solutions to crime incidence. Aside from this, the PNP reported that the command has taken serious and aggressive measured to discipline police personnel who were involved in some illegal acts and has instituted actions to further improve the discipline of its personnel including the conduct of background investigation of personnel and swift resolutions of cases. Meanwhile, the army’s 8th ID declared their dismay over the loss of lives after government troops clashed with local terrorists particularly during the time when the ceasefire was in effect in December. Suspension of Military Operations (SOMO) were placed in effect as peace talks were being reopened; however, the army further reported attacks were made on government soldiers. A number of these attacks occurred in Las Navas, Northern Samar. Concerning internal security threat, the army still considers the Eastern Visayas Regional Party Commitee (EVRPC) is still considered as the major threat in the region as the army reported a total of 3 ambuscades, 2 sniping, 1 murder, 1 harassment and 1 arson to have occurred in 2010 up to the present. The army likewise believed that high ranking officials of the CPP-NPA are present in the region and making the tri-boundary area of the three provinces in Samar island as their hideout. On the other hand, the army division commander likewise disclosed they are closely working with the PNP to contain the active presence of private armed groups in the region. As per report there are still two active PAGs existing in the region and may number to three as one of the identified group is presently having a power struggle and may splinter into two separate groups. 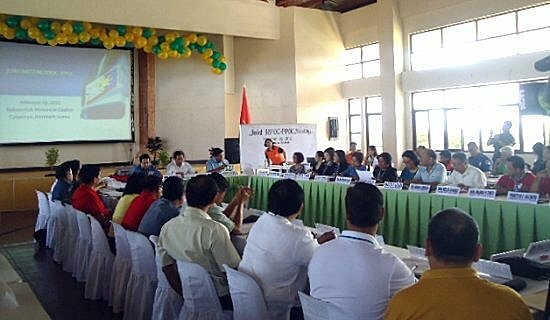 The RPOC Meeting was held jointly with the Provincial Peace and Order Council Meeting of Northern Samar which was chaired by Northern Samar Governor Raul Daza. CATARMAN, Northern Samar – The Commission on Filipinos Overseas is now in Catarman, Northern Samar for a three-day information campaign as part of the Commissions’ annual community education program (CEP). At 8:00am today, the team conducted a symposium at Colegio de San Lorenzo Ruiz attended by more than 200 students and members of faculty. Same activity was organized at Northern Samar Colleges and gathered more than a hundred students. This community education and information campaign program seeks to assist prospective migrants in making informed decisions regarding settlement abroad as well as to generate community involvement in migration concerns, CFO said. It also aims to raise public awareness on various issues concerning migration, intermarriage and existing government policies and programs directed against illegal recruitment, documentation fraud and human trafficking, among others. In line with the said info campaign, the office of the Chancery of the Diocese of Catarman under the leadership of Bishop Emmanuel C. Trance instructed the social action center to read the letter of Director Maria Regina Angela G. Galias of Migrant Integration and Education Division during the mass and invite the faithful to participate in the symposium organized by the CFO team. According to Ivy Miravalles of CFO, in the afternoon of February 24, they are set to meet with PNP Northern Samar and make a courtesy call on the Provincial Governor Paul R. Daza. To reach a wider audience, the Philippine Information Agency-Northern Samar, scheduled an interview with the team in “Huruhimangraw sa Panginudto” radio program, aired over radio station DYSM on February 25. BORONGAN, Eastern Samar – The Overseas Workers Welfare Administration (OWWA) is worried that there are a few takers of the OWWA Overseas Filipino Workers -Dependents Scholarship Program (OFW-DSP) in Eastern and Northern Samar. OWWA Information Officer, Alberto M. Peñaflor in a recent visit to PIA Eastern Samar aired this concern. “Some dependents do not qualify because their parents earn more than the required income that the scholarship dictates,” Peñaflor said. Another concern aired is that maybe OWWA dependents are not aware of the scholarship program. OWWA then sought the help of Radyo ng Bayan-DYES and PIA for information dissemination. The scholarship program offers an annual financial assistance to qualified dependents of Overseas Filipino Workers. Workers should have a monthly salary of 400.00 US dollars or below. The OFW dependent shall enroll in any four or five years baccalaureate or associate course leading to a baccalaureate degree in State Colleges or Universities or Commission on Higher Education (CHED) accredited schools. Other criteria say that the applicant must be a Filipino Citizen, single, not more than 21 years of age, a high school graduate / about to graduate from high school or already enrolled in college. The applicant should also be physically, mentally and morally fit, and must pass the qualifying examination conducted by an OWWA-partner State College / University or any CHED recognized and accredited educational institutions in the country. Aside from the P10,000 financial assistance, the qualified applicant will also avail of a group health insurance coverage of P100,000 per scholar. For further details, the interested applicant may call PIA Eastern Samar with telephone number 560-9551, OWWA Regional Office 8 (053) 321-4376 or 523-0315 or hotline 09165945715. They may also contact their school for application forms or further details. TACLOBAN CITY, Leyte – The regional chief of the Bureau of Fire Protection (BFP) this region proposed the organization of barangay fire brigades in all barangays in Eastern Visayas that will compliment the limited manpower of the bureau. This was the crux of the message of SSupt. Pablito D. Cordeta, Regional Director, BFP 8 delivered by Senior Fire Officer Ramil Riños in the launching of Text Fire Tacloban, Wednesday, February 23 at the Rotary Club Center here. SSupt Cordeta admitted that government cannot immediately hire additional firefighters to man the different fire stations in Eastern Visayas. He said he is proposing the organization of Barangay Integrated Defense Action (BIDA) in all barangays in Eastern Visayas whose objective is to serve as manpower multiplier of the bureau. “This will not only help during actual conflagration but also supports in our advocacy towards fire prevention”, SSupt. Cordeta added. He further said that tapping the barangay will help address the manpower requirement of BFP considering the bureau’s limited human resources. Meanwhile, the BFP chief in Region 8 emphasized to fire volunteers their role as force multiplier of the bureau as first line of defense against destructive fires. He also recognized the important role of fire volunteers as the bureau’s partner in public service through closer coordination and harmonious relationship to attain the BFP’s main goal in preventing and suppressing fire. SSupt. Cordeta also mentioned the launching of TXTFire Philippines as a milestone for volunteers not only in Tacloban City but to the whole of Region 8. “The BFP Region 8 strongly supports with this new innovation of informing the public of fire alarm anywhere in the region immediately that will call the attention of the BFP personnel in responding to the fire call”, SSupt. Cordeta added. CATARMAN, Northern Samar – The University of Eastern Philippines is in a high spirit as it produces 67 new registered nurses in the recently concluded Licensure Examination for Registered Nurses (RNs) as per result released by the Philippine Regulatory Commission (PRC) on February 20, 2011. According to the University Publication and Media Affairs Office, UEP, once again, is in the forefront garnering a high 82.89% passing rate which is considered to be the hardest hurdle compared to a very low 35.24% national passing rate. This, according to UEP, proves the excellence in academic and practical preparations and training made through the efforts of capable and efficient faculty led by the current dean Professor Ma. Linda S. Agus in honing the students to excel. The university president, Atty. Mar P. De Asis and the whole UEP family is elated over the result and extend their congratulations to the 67 new RNs. 31. LAGUITAN, Ma. Jerrel; 32. LEAÑO, Roda; 33. LIM, Christine; 34. LOZANO, Ian; 35. MABAIT, Leo; 36. MAGDARAOG, Bernard; 37. MAGHACOT, Neck Jun; 38. MORALDE, Angelica; 39. MORALLOS, Bryan; 40. NIVAL, Joyce; 41. NOROÑA, Beryll Aian; 42. OLAJE, Vanessa; 43. ONG, Mervin; 44. PINCA, Clarilyn; 45. QUIMINALES, Madeleine; 46. RACHO, John Michael; 47. RIVERA, Ma. Rhonjie; 48. ROBLES, Janie Bell; 49. ROSALES, Adrian Joseph; 50. SIAGO, Kristine Jemimah; 51. SINGZON, Jonah May; 52. SOSING, Chloe; 53. SULEIMAN, Jamaica; 54. TAN, Charie; 55. TANTUAN, Annie Mey; 56. TARRAYO, Kareen Kay; 57. TIRAZONA, Aynrand Victor; 58. TUBALLAS, Amelyn; 59. TUBELLO, Alberto Jr.; 60. UNAY, Jonna Mae; 61. VALENZUELA, Toni Rose; 62. VILLARINO, Abeed Paul; 63. YAPIZ, Micka Martha; 64. AFUNDAR, Joseph Jr.; 65. DE GUIA, Regidor Jr.; 66. JALDO, Ruel; 67. LIM, Angeela Sheena. Romula Obleopas of University Publication and Media Affairs Office, said the UEP-College of Nursing has consistently surpassed the national passing rate in producing professional nurses. In 2008, it ranked 15 among the top performing Nursing Schools in the Philippines. TACLOBAN CITY – A fast and quick scheme of responding to fire incident this city known as TXTFIRE Tacloban was launched on Wednesday, February 23 at the Rotary Club Center here. The launching of the Text Fire Tacloban was led by the Tacloban Delta Volunteer Fire Reserve, Inc. in partnership with the TXTFIRE Philippines Foundation, Inc. Under this scheme, a resident of this city who owned a cellular phone and has a firsthand information on occurrence of fire incident can send his message by typing Report TAC<space> Location and send to 0918-6-888-888. According to Mark Aquino, Tacloban Delta Fire Marshall, texters need not worry since the scheme is free of charge after registering the number of the cellular phone by typing Register<space>Full Name and Address and send to 0918-6-888-888. Residents will just type FIRE TAC and send to 0918-6-888-888 to get information as to the place of occurrence of the fire incident, Aquino said. Aquino informed that the fire volunteers group this city has 38 active members and 20 members responsible in responding to emergency medical calls. He added that their active fire volunteers were equipped with the required trainings and skills on fire emergency responses in accredited training facilities only located in Laguna and Ilo-Ilo. The Tacloban Delta Fire Marshall further said that their group will not only respond to fire calls but also in emergency medical response such as in conducting a quick response to rescue victims in case of vehicular accident and any call which needs immediate medical attention and response. This quick response scheme will surely save lives and prevent the loss of properties, Aquino said basing on their group’s battlecry “we are there when needed because every second counts”. MALACAÑANG – Executive Secretary Paquito N. Ochoa Jr. on Wednesday led the signing of a memorandum of agreement (MOA) for the establishment of a P12.9 billion hydropower and irrigation project in Isabela which will generate 100 megawatts and irrigate 41,700 hectares of new areas to boost food sufficiency. The MOA was signed at the launching of Isabela’s Local Convergence Agro-Enterprise Cluster, a project of the Convergence Initiative undertaken by the Departments of Agriculture, Agrarian Reform, and Environment and National Resources (DA-DAR-DENR), in partnership with the provincial government, Mindano Grains, PhilMaize, S/N Aboitiz, and the Filipino-Chinese Chamber of Commerce and Industry. Once completed, the project will generate power for the towns of Ilaguen, San Agustin and Tumauini, and provide irrigation to new areas in the municipalities of Ilagan, Gamu, Jones, Tumauini, Cauayan, San Mariano, San Agustin and Benito Soliven. According to the Executive Secretary, the project is line with the Aquino Administration’s agenda of empowering farms and rural enterprises to become vital components in the government’s drive to achieve food security and more economic growth in the countryside. “Our presence here today is evidence enough that we are taking this as an unwavering commitment to our people. We will uplift the welfare of our farm and rural workers, and, in the process, we will establish the systems and infrastructure so that food self-sufficiency is realized during and beyond our term,” Ochoa said. To achieve this goal, he said, the government has started taking steps to move away from heavy dependence on rice imports and clear the bottlenecks in the bureaucracy that impede efforts of agencies to achieve the shared objectives. One such step is the DA-DAR-DENR National Convergence Initiative, a multisectoral and integrated approach wherein three rural development agencies will undertake joint planning, programming and budgeting. They will also have a common or well-coordinated effort at all levels from the grassroots up to the level of the department heads. “The projects we are kicking off today are examples of what can be achieved if the goals of the Convergence Initiative are realized,” Ochoa said. Ochoa was joined by Agriculture Secretary Proceso Alcala, Agrarian Reform Secretary Virgilio De Los Reyes and Environment Secretary Ramon Paje and Isabela Gov. Faustino Dy III, NIA Administrator Antonio Nangel, Filipino-Chinese Chamber of Commerce Chairman Alfonso Uy, PhilMaize Chairman Roger Navarro, Mindanao Grains CEO Roderico Bioco, and S/N Aboitiz CEO Emmanuel Rubio at the signing ceremony that coincided with the week-long celebrations of the 25th anniversary of the EDSA People Power Revolution. Also present were Isabela Representatives Napoleon Dy, Ana Cristina Go, Giordi Aggabao and Rodolfo Albano Jr., and Mayor Benjamin Dy. “As we celebrate the EDSA Power Revolution, it is best to honor the event by devoting ourselves to making sure that we greatly reduce those who are poor, those who suffer the pangs of hunger and those whose poverty denies them and their children an opportunity to secure a bright and stable future,” Ochoa said. PASAY CITY – Senate Minority Leader Alan Peter Cayetano has urged both the Senate and the House of Representatives to work for the early passage of the Freedom of Information (FOI) bill in spite of reluctance of the Aquino administration to certify the urgency of the bill. Cayetano said the early passage of the Freedom of Information (FOI) bill will not only ensure transparency and accountability in the government but will establish an institutional mechanism by which the citizenry can be empowered by giving it access to public documents that involve public interests. "By aggressively working for the passage of the bill, both the Senate and the House of Representatives can also show that we are, indeed, an independent branch of government with its own priority agenda irrespective of the executive's priorities," Cayetano said. “While we in the Senate are still hoping the Palace will soon have a change of heart and later certify the FOI bill as urgent, nothing should prevent the House of Representatives and the Senate into making it a priority bill,” he added. The senator, principal author of the FOI bill, earlier expressed disappointment at Malacanang’s decision not to include the FOI in the list of 17 priority bills after repeated assurances during the presidential campaign that the passage of the FOI bill will be one of his priorities once elected. He recalled that then Senator Benigno Aquino III also voted for the passage of the FOI bill during the 14th Congress. The minority leader said both chambers of Congress have been burdened for so long with having to conduct series of hearings and investigations in aid of legislation on reported anomalous transactions by government agencies like the NBN-ZTE, Fertilizer fund scam and now the AFP corruption and the Garcia plea bargaining deal, and those hearings were hampered by refusal of government agencies concerned to release pertinent documents unless these were subpoenaed. The holding of such hearings, he said, can be minimized and prosecution of guilty parties can be expedited with the FOI law in place. "Since the Philippine Anti-Graft Commission has been dissolved by the Aquino administration and the establishment of the touted Truth Commission has been derailed, only the early passage of the FOI bill now will redeem President Aquino's campaign promise to lead the fight against unabated corruption in government," Cayetano said. MAASIN CITY, Southern Leyte – The Department of Education (DepEd) had already started vegetable gardening through “Gulayan sa Paaralan” program, a continued project under the Food for School program in order to support not only the parents’ livelihood but also to reduce the incidence of malnutrition throughout the province. DepEd Supervising Nurse Teresita Marquez disclosed in a short talk over phone that the “Angara Bill dubbed as Oh my Gulay had already started at our level through the Gulayan sa Paaralan implemented at all elementary schools in the province.“ We also required at least 100 malunggay plants in each elementary school and 50 for every primary school throughout the division of Southern Leyte, she added. The program will not only help combat hidden hunger as what Sen. Edgardo Angara’s aim for the “Oh my Gulay” program, but will also teach primary, elementary and high school students as well, to be self-sufficient, Marquez said. The DepEd’s cause was closely coordinated by the Department of Agriculture which likewise intends to foster public awareness in the health, nutritional and economic benefits of planting vegetables in schools and at home. On the other hand, the City Agriculture’s Office through City Agriculturist Amado Acasio revealed that they had implemented the “Makulay ang Bahay” few years back, for every barangay throughout the city. It was a sort of competition which they had given prizes to the first three winners and consolation prizes to every participant-barangays, he bared. The city selected the top 20 barangays and 20 schools with high malnutrition rate which was assessed to participate in the “Makulay ang Bahay” competition. The project started last 2007 yet. Acasio disclosed that the program was aimed to encourage each household and schools to plant vegetables and provide safe and nutritious food for every family’s consumption and in school canteens. The program also promotes proper composting and the use of organic farming technologies. Though, last year they did not pushed the contest due to lack of funds and time to evaluate the competing barangays, but a continued distribution of vegetable seeds was made as a regular program of the city agriculture here. The Angara Bill was fully supported by the Department of Agriculture (DA), Department of Science and Technology (DOST), Department of Health (DOH), the DepEd and other private organizations throughout the country. "There's a way to fight this so-called 'hidden hunger' – by eating vegetables loaded with vitamins and minerals which are vital to school-age children and the key is to get kids involved in planting, growing and harvesting these veggies, whether at home or in school, so they become more eager to eat them," he explained in a press release. PALO, Leyte – Some 100 women from Palo are on track to living a cancer-free life after getting cervical cancer vaccines while some 100 children were given pneumococcal vaccines courtesy of Presidential sister Kris Aquino who brought her Medical Mission on Pneumococcal and Cervical Cancer Vaccination Sunday at the Archbishop Hall here. The TV host-actress, the youngest sibling of President Benigno “Noynoy” Aquino, said the free vaccination for women and children in Palo was conducted as part of her social contribution as presidential sister and also an effort on her part to help Filipino women fight against cervical cancer which is considered the second killer among women of all ages, next to breast cancer. It was learned that everyday, about 12 Filipinas suffer from cervical cancer, making it a cause of concern not just to women, but to their loved ones as well, male partners included. Kris said with the vaccine, women are 80 percent protected from the virus that is mostly rooted from sexual contact. With the vaccination, women will get protection against 12 other cancer-causing HPV types which include HPV strain 45, a strain which prevalently causes a more severe form of cervical cancer among Filipinas. The free medical care was also supported by Glaxo Smith-Kline pharmaceutical company, the provincial government of Leyte and the local government unit of Palo. In Kris’ speech, she thanked Palo Mayor Remedios “Matin” Petilla and Governor Carlos Jericho Petilla for their support. She added she has chosen Palo as among the first recipient of her medical mission as part of her promise during the electoral campaigns here in May 2010. “I promised that I would come back and bring help in any way we can. Mayor Petilla was one of the first to really believe in ‘Noy (President Aquino) and Gov. Petilla was, I would say, one whom I personally convinced to support ‘Noy. Lahat ng kabutihan na ibinigay niyo sa amin during the campaign, ibabalik din naming in the next five years and more,” the TV host said. Meanwhile, aside from the free pneumococcal vaccines for the children, Kris also distributed hundreds of toys for the kids in attendance. She likewise visited children at the Lingap Center at the Government Center in Palo, Leyte where she also distributed toys and a book titled “Noynoy’s sisters” which chronicles her roles and her other presidential sisters Ballsy, Pinky and Viel in PNoy’s life. NAVAL, Biliran – The Fiber Industry Development Authority (FIDA) in the province of Biliran reported the situation of the abaca industry in the area during a forum today attended by sectoral representatives of the province, local government officials and some representatives of the national government agencies (NGAs). In his report, Joseph “Von” Salas OIC Provincial Fiber Officer of Biliran bared that the province of Biliran is very suitable to abaca because of its moderate climate which is not hot nor cold. He added that there are some 1,500 to 2,000 hectares of land in the province that are planted to abaca as he said that there are some 600 abaca farmers in the entire province. Furthermore, the situation of the abaca industry in the province puts the abaca farmers to a good advantage because the abaca plants have never been attacked by bungy top and other pests unlike in other provinces where the abaca plantations were seriously affected by diseases. During the forum, Mr. Salas also reported the accomplishments and activities of FIDA-Biliran in 2010. He informed that in 2010, a series of visitations was conducted by FIDA-Biliran in some barangays in the province where abaca plantations are nearly located. During these visits, fora were conducted to abaca farmers to update them on the modern technology of planting abaca for them to get higher production that leads to more income. Part of the activities of FIDA-Biliran in 2010 was the massive information campaign urging farmers to continue planting high quality abaca through radio guestings through radio programs “Sibya sa Probinsya” of the provincial government of Biliran and the “Kapihan sa PIA” of the Philippine Information Agency - Biliran Provincial Office. The radio programs, he said, provided an avenue for farmers to get updates from FIDA-Biliran on in the abaca industry in Biliran province. He added that in 2010, Lakbay Aral to other provinces within region 8 and outside of the region were conducted to give abaca farmers an opportunity to observe how abaca plantations in other places were managed. Stripping demonstrations were conducted to abaca farmers to get the best quality abaca fibers with less wastage. A turn-over ceremony of the improved stripping device took place after the presentation of Mr. Salas. FIDA regional office through Director Jeffrey Espeña who was present during the occasion handed the improved stripping device to the provincial government of Biliran. He was assisted by Joseph Salas. The equipment was received by Julia Tuston, Agriculture Technician of the Office of the Provincial Agricultural Services (OPAS). “The improved stripping device will be used by the Biliran abaca farmers in the abaca industry in the province on rotation basis”, Mr. Salas said.